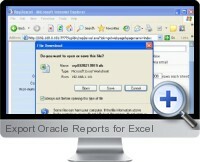 Export Oracle Reports for Excel can convert Oracle report output to excel format. It can enhance your Oracle Reports Server by exporting output to rich formatted excel reports. Oracle Reports is a comprehensive reporting tool for enterprise wide reporting, information delivery, analysis and decision-making. However, it is difficult to output Excel reports from oracle reports. Export Oracle Reports for Excel accomplishes this. Export Oracle Reports for Excel is a win32 console application. It can export HTML files generated by Oracle report server (6i or higher) to MS Excel format. The output Excel file can then be accessed via a browser. Export Oracle Reports for Excel can convert the report not only in HTML but also in HTML with CSS to retain formatting styles within the resulting Excel report. Integrate with web based report - call the export routine from the Oracle form. Supports report export with CSS formatting - especially useful for retaining cell and table border styles. Deletes unwelcome rows and columns in HTML report format. Output to the file system. Excel file can be sent by email to be shared between users.